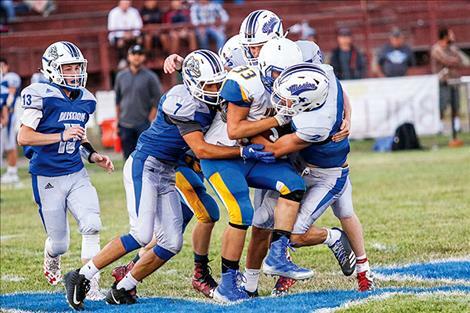 It was a Bulldog pile up on the Victor running back. Bulldog Wacey McClure scampers into the end zone. Bulldog Jedi Christy (#88) celebrates a touchdown with teammates. Bulldog Isaac Dumontier looks down field for an open receiver. ST. IGNATIUS – After a slow start on Friday night’s season opener against the Victor Pirates, the Mission Bulldogs put on a show for the home crowd in a 44-12 rout. 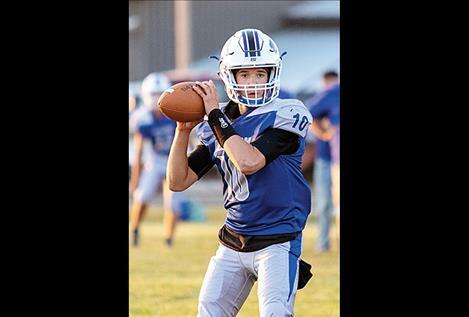 The game got off to an ominous start for the Bulldogs’ offense, who threw an interception in their opening drive as well as their second offensive possession following Victor’s capitalizing on the turnover with a touchdown. With the Pirates leading 6-0 early, both offensive squads seemed to be afflicted by first game jitters and struggled moving the ball up and down the field during the first quarter. 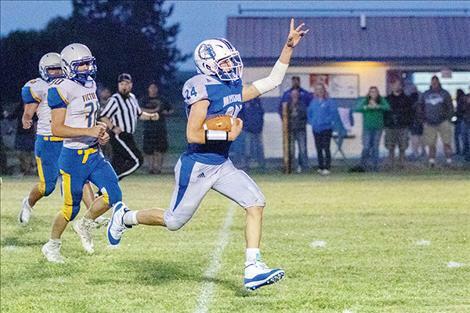 The Bulldogs got on the board with just seconds left to play in the first quarter when junior quarterback Isaac Dumontier connected with junior tight end Jedi Christy on a nice short touchdown pass. “Dumontier had a rough start but once he found his groove it was good from there,” said Murray. Mission grabbed a 14-6 lead in the second quarter when Christy snared yet another touchdown pass from Dumontier. 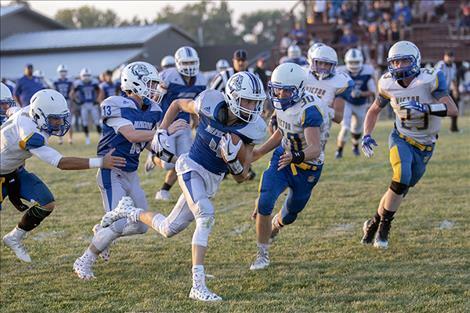 The second quarter belonged to the Bulldogs, as the defense dominated Victor’s offense holding them scoreless, while the Bulldog’s offense rattled off 20 unanswered points. Emerging from halftime with a 26-6 lead, the Bulldogs scored three more touchdowns to take a commanding 44-12 lead by the early fourth quarter. With the game well in hand, the Bulldog’s mop up crew entered the game and earned valuable in game experience early in the season. Dumontier landed 14 passes for 188 yards and five touchdowns, while running eight times for 16 yards and one rushing touchdown. Junior running back Troy Matt carried the ball 13 times for 73 yards and a touchdown. Both Christy and Wacey McClure had two reception touchdowns apiece on the night. Christy had three receptions for 46 yards, while McClure had six receptions for 62 yards. 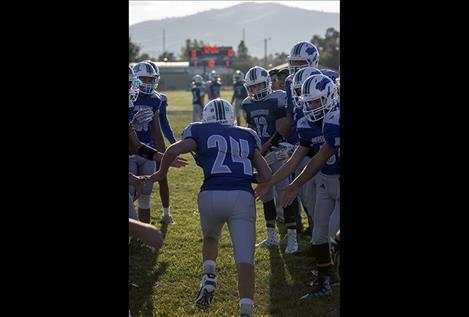 The defense cause three fumbles and recovered two, had two pass defections, picked off one pass, sacked the quarterback once and had four tackles for negative yards. 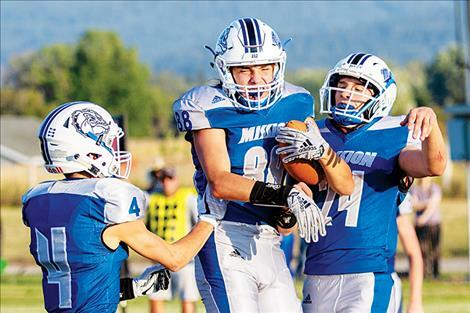 Up next for the Bulldogs, the team will travel to (0-1) Clark Fork at 7 p.m. Aug. 31. Clark Fork lost 50-16 in their game against Flint Creek Saturday in Butte.